When Family Vacation Dreams Come True! What is it that makes Hawaii so special? In poll after poll, it ranks as the top vacation destination for families. But is it really worth the long trip for us East-coasters, what with the tropical Caribbean islands and the beaches of Mexico just a short plane ride or two away? Well, quite simply – yes!The islands of Hawaii have it all: a unique history; fascinating culture; incredible natural beauty; friendly locals eager to share their aloha spirit; luxury resorts designed specifically for families; outdoor activities and water sports galore; and an inspiring variety of wildlife. For curious, active families seeking an iconic family trip that will provide long-lasting memories, our fiftieth state is well worth the journey. The Aloha State joined the union in 1959, but Hawaii’s history goes back centuries earlier. Hawaii’s first residents were Polynesians from the Marquesas Islands, who, 1,500 years ago, journeyed thousands of miles in dugout canoes guided only by the stars. A few hundred years later, settlers from Tahiti arrived. Traditions such as hula dancing and surfing were established, and in 1778 a visit from Captain James Cook introduced the islands to the West. Local leader King Kamehameha united the islands into one royal kingdom in 1810. After Protestant missionaries arrived in 1820, Hawaii became a port for seaman, traders, and whalers who brought with them western diseases that took a heavy toll on the native population. In 1893, American colonists overtook the royal government in a peaceful, but somewhat controversial coup, and in 1898 Hawaii became a US territory.In the twentieth century, the rise of sugar and pineapple plantations brought immigrants from Japan, China, the Philippines, and Portugal, creating today’s diverse population. But the historical event most familiar to Americans is Japan’s surprise attack on Pearl Harbor on the island of Oahu on December 7, 1941. Overall, the unusual history of Hawaii and mixture of global influences provide a rich and engaging educational opportunity for families. Of the six main islands to visit in Hawaii each with its own distinct personality, the four most popular for families are Oahu, Hawaii Island, Maui, and Kauai. Oahu, known as the “Heart of Hawaii,” is home to the state capitol, Honolulu. 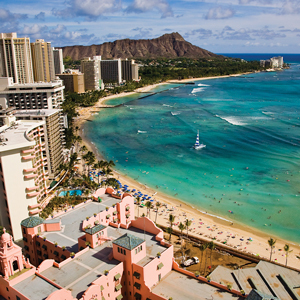 World travelers arrive to play on Waikiki Beach, experience world-class shopping, and experience Polynesian culture. Hawaii Island, also called the Big Island, is the “Island of Adventure” and features an erupting volcano, rain forests, and jet-black sand.Maui is the “Magic Isle” with plentiful, white-sand beaches and the scenic coastal road to Hana. Kauai is the “Garden Isle” and is best known for its adventurous activities, lush tropical mountainsides with dramatic cliffs to the sea, and stunning views of waimea Canyon. The two remaining islands, Lanai, the “Most Enchanting Island” and Molokai “Hawaii by Nature,” are the least-developed islands and offer solitude, unspoiled landscapes with beautiful vistas, and easy, relaxed exploration. 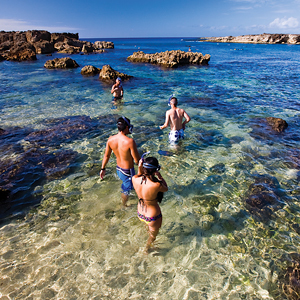 More old-style Hawaii, these islands are most often recommended for honeymoons or rejuvenating getaways for couples. Although for many busy families, this simpler way of life may be appealing. What’s the best time to visit Hawaii? Truly, the weather is outstanding yearround with average temperatures from 75 to 85 degrees. Go anytime to enjoy a tropical, temperate climate and an open-air style of living that is the outdoor-lover’s dream. Things warm up a bit in the summer with highs occasionally in the low nineties, but even then, trade winds keep it comfortable. The busiest seasons are naturally the family-friendly summer months and the winter-break timeframe.January to April is prime whale-watching season when humpback whales migrating from Alaska come to the warm waters off the coast of Maui for breeding and birthing. Fall months offer the best lodging values, similar to what we might think of as off-season rates closer to home. Most visitors arrive in Hawaii at Honolulu International Airport on Oahu, and the best travel advice for getting there is to take United Airlines’ new non-stop flight from Washington/Dulles. It’s a ten-hour flight and leaves mid-day, so it’s easy to drive up in the morning, avoiding an overnight stay the night before. With the five-hour time change (six during daylight saving time), travelers land in Hawaii in the late afternoon with plenty of sunlight to reset their body clocks and minimize jet lag. Alternatively, connect to flights from several other US cities to oahu, Maui, Kauai, and Hawaii Island. After a few days exploring Oahu, take a short inter-island flight to Maui, Kauai, or Hawaii Island. With a two-week vacation, it is possible to include a third island too.Choosing which islands to visit can be difficult, but with an abundance of familyand kid-friendly adventures and fabulous resorts and condo options on each one, it will be a wonderful vacation regardless. During a stay on Oahu, Waikiki Beach is a must-see with its high-rise hotels and luxury shopping areas filled with international tourists. Take a surfing lesson and hike to the top of Diamond Head, a 760-foot extinct volcanic tuff cone and National Landmark, for panoramic views of the island. Climb aboard a battleship at Pearl Harbor and learn about this chapter in our nation’s history with its visitor center, museums, monuments and exhibits including the new USS Arizona Memorial constructed above the sunken battleship. The newest resort on Oahu is the very popular Disney’s Aulani Resort and Spa, creatively designed with a focus on Hawaiian history. Other top hotels include the historic Royal Hawaiian on Waikiki Beach, and the Kahala Resort just a few minutes outside of Honolulu, which features a kid-friendly calm water beach and dolphin lagoon right outside the rooms. On Maui, swimming, snorkeling, surfing and relaxing on the excellent beaches are top activities but there is more to explore!Early risers can catch the sunrise at Haleakala National Park, one of Maui’s most memorable attractions with its unusual lava forms and dormant volcano rising to 10,000 feet. Bike down from the top for a thrilling and scenic ride that appeals to adventurous families. Play golf on one of the renowned championship golf courses or go for a catamaran sail and snorkel with sea turtles. Many families choose to stay on Maui in one of the condominium resorts along the beautiful white-sand beaches of Ka’anapali.Not only can you enjoy extra living space and full kitchens to stock with groceries, but families can also benefit from full-service resort amenities. Walk along the beachfront path to shops and restaurants. Another popular area is the beach of Wailea, with top luxury resort properties like the Four Seasons Resort Maui featuring a scenic adults-only infinity edge pool and complimentary children’s programs. Fairmont Kea Lani with family suites, or the Grand Wailea, known for its floating restaurant and Hawaiian-style water park, are also favorites. Visiting Kauai, families will behold a dramatic, emerald-green landscape, an abundance of outdoor adventures, and a relaxed pace. Hike the ultra-scenic and undulating cliffs of the Na Pali coast, reached only by foot, air or sea, and behold uninterrupted views from 2,000 feet above the Pacific and picture-perfect white sandy coves. Take a helicopter ride into massive Waimea Canyon, or drive to one of its many awesome lookouts. Paddle through jungle-like forest on the Wailua River and have a picnic lunch under the waterfalls.Soar above the treetops on a zip-line tour where you’ll learn about Kauai’s diverse ecosystem of rare plants and animals. 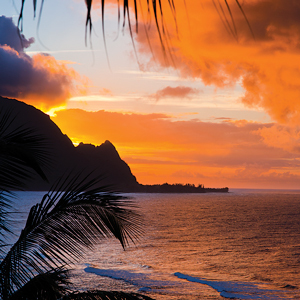 There are many choices for family-friendly lodging in Kauai. The Outrigger Waipouli Beach Resort with a great pool for kids is one of the nicest centrally-located condominium resorts. On the sunny south shore of Poipu Beach, the Grand Hyatt Kauai Resort and Spa with its water wonderland of saltwater lagoons and freshwater pools, is a top choice. Featuring one of the world’s most active volcanoes, Hawaii Island can’t be beat for natural wonders and dramatic scenery. Witness the astonishing sight of glowing red lava flowing from Mount Kilauea, which has been erupting continuously since 1983.Ponder the universe under some of the world’s best stargazing conditions at the Onizuka Center for International Astronomy near the top of Maunakea, the tallest sea mountain in the world. Discover ancient petroglyphs carved into rocks along the Kahala coast. Ride horses or take a wagon ride in the wide open spaces of the Kahua ranch in the Waimea valley. Or, snorkel with manta rays along the Kona coast or take a boat tour to see playful spinner dolphins leap and spin out of the water in the boat’s wake. Beachfront luxury resorts, villas, and condominium options are plentiful on the Big Island. Three renowned hotels catering to families are the Four Seasons Resort Haulalai where guest rooms have outdoor lava-rock showers, the Mauna Kea Beach Hotel located on one of Hawaii’s best beaches, and the newly renovated Fairmont Orchid. Hawaii’s two official languages are Hawaiian and English. The Hawaiian Language is a Polynesian dialect with only 13 letters in its alphabet, hence the many similar names! A few words to know? Mahalo, thank you; lei, a flower garland given in welcome or on other occasions; keiki, child and ‘ohana, family; and of course, aloha, a greeting or a good-bye. The dress code in all of Hawaii is resort-wear (casual, yet fashionable by definition), even at the finest restaurants and hotels. Temperatures are cooler in the evening, so a sweater and slacks are a good idea. It’s a custom in Hawaii to slip off your shoes when entering a home. Naturally, a major bonus of traveling to Hawaii is that Us citizens are not required to have passports or pass through customs, and that the Us dollar is the currency.Beaches in Hawaii are public, but refreshingly, no beach vendors are allowed. Because of the many choices of lodging and activities in Hawaii, and because odds are this will be a once-in-a-lifetime vacation as a family, it’s a good idea to do some research independently or work with a travel advisor who can help match your family’s interests to the many choices that are available. With travel logistics and tours taken care of, you and your family will be in a position to absolutely revel in your Hawaiian holiday.